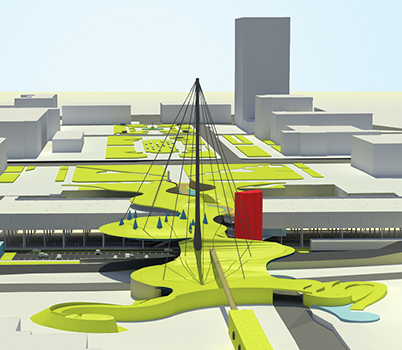 The Magic Carpet is an undulating park that hovers over Cleveland's new transportation center, weaving together the urban and the organic into a seamless and dynamic whole as it connects the Mall and the City to the Lakefront. Bus, light rail and high speed train terminals, vehicle parking and commuter bike facilities are vertically linked to the park above, while a raised landscape path continues the uninterrupted pedestrian connection from the City to the Lakefront. New Urban Realms rethinks the opportunities of left-over, inbetween, and forgotten space and inhabitants of the american city, and explores the creation of public places without formal hirarchy, boundaries, and ordered-from-above processes. It proposes a new form of physical place making where the voices, places and the stuff of common life are used to empower everyday situations, spaces, and objects. Our involvement in the Plaza Centro Master Plan enabled the capture and re-programming of 60,000 SF of urban land, and reconnected the 4th Avenue Merchant's District with the Historic Core along Congress Street. Inviting pedestrian bridges, a widened and art-lined sidewalk through the historic underpass, and a cascading stair landscape transformed a formerly neglected area into an inviting public space. Client: City of Tucson and Oasis Tucson. 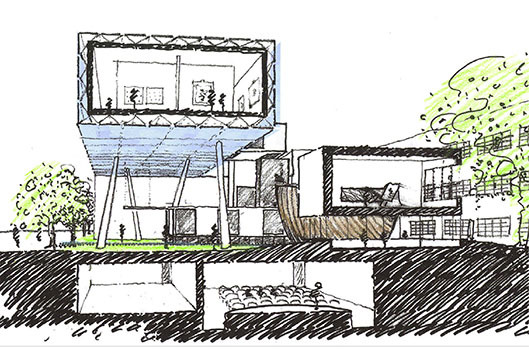 This scheme for San Jose State University provides flowing access to classroom and display pavillions, a floating gallery, and underground services building through an open courtyard that is a special destination in itself. By reusing the existing building entirely and eliminating unnecessary circulation, the cloud scheme reduces overall built area, material and energy consumption, and environmental impact of the program by 25%. Scope: Art School + Museum 30,000 SF. The dynamic edge between private and public space is where we feel architecture can truly make a difference for society. Preserving a human scale while connecting individual spaces and uses into a larger, symbiotic whole is the ultimate goal of planning built enironments of any scale, and we believe that only buildings that are conceived and act as part of a living, ever changing system can be truly poetic and enduring.